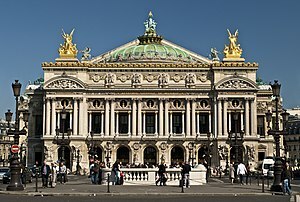 The Palais Garnier (pronounced [palɛ ɡaʁnje] French (help·info)) is a 1,979-seat opera hoose, which wis biggit frae 1861 tae 1875 for the Paris Opera. ↑ Ayers 2004, pp. 172–174. ↑ Mead 1991, p. 146. Haussmann reported on 14 August 1871 that the site had been cleared and surveyed. A temporary building for the Opéra Agence was erected in August, and excavation was begun on the 27th. ↑ Mead 1991, p. 197. According to this source, more work was done after this date, and some parts of the building were never completed. The figure does not include the costs of acquiring and clearing the land, which was the responsibility of Haussmann's Service d'Architecture and probably exceeded 15 million francs (Mead 1991, pp. 140, 146). ↑ Nuitter 1875, p. 250. Heights are measured from the ground level of the Place de l'Opéra. The sculpture at the apex of the stage flytower roof is not included, but would add an additional 7.50 metres. ↑ Nuitter 1875, pp. 249–250. The length is measurt frae the sooth side o the principal facade tae the north side o the avant-corps o the admeenistration; the widths, atween the exteriors o the twa lateral galleries, an the east an wast pavilions; basement depth, frae the grund level o the Place de l'Opéra tae the bottom o the cistern unner the stage hoose. ↑ Mead 1991, p. 156.